Lys Glacier drains south from Lyskamm in the Monta Rosa Group of Italy. This glacier has a long history of observations that have indicated two short term advances in the 20th century 1912-21 and 1973-85 amidst a broader retreat. The net change for the 1915-2004 interval was a 600 meter retreat (Smiraglia et al, 2006). They also noted a 10% area extent loss from 1975-2003, and since the glacier was advancing up to 1985 this change occurred more rapidly. The Italian Glacier Commission report on terminus change of this glacier annually in the two latest reports Lys Glacier retreated 10 m in 2012 and 20 m in 2011. The total reported retreat from 2005-2012 was 186 m, more than 20 m per year. Here we examine Landsat images from 1990 to 2014. 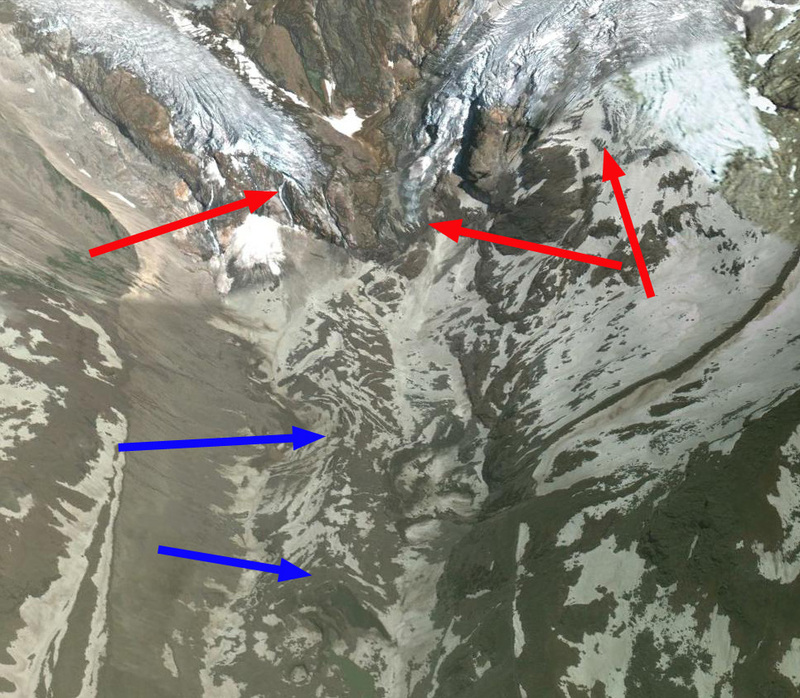 In 1990 two branches of the glacier merged in the valley bottom and extended to the red arrow marking the terminus of the glacier at that time. 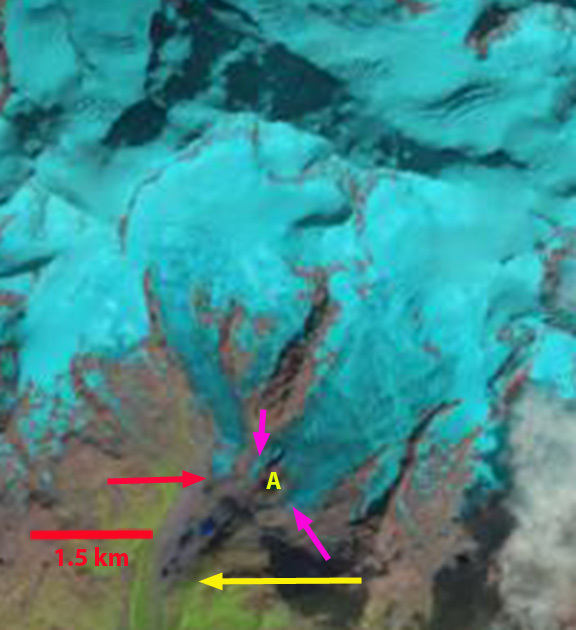 The yellow arrow indicates the 2014 terminus position, and the yellow A indicates a prominent bedrock knob that a branch of the glacier encircles, pink arrows. 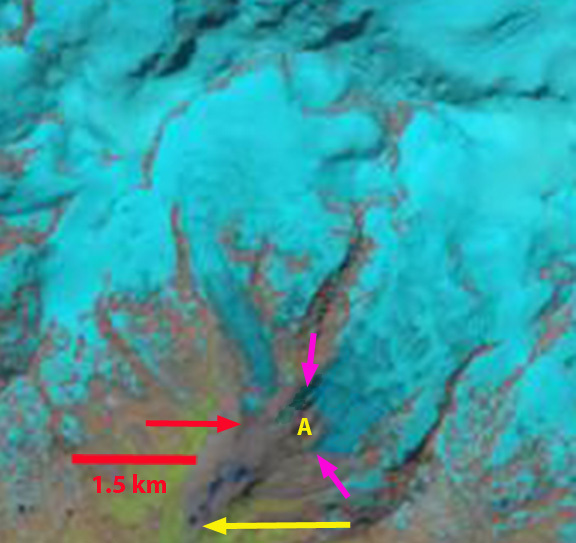 By 2013 the glacier in the main valley have separated, there are a few small lakes forming amidst the decaying stagnant ice tongue between the yellow and red arrow. The bedrock knob at Point A has greatly expanded. In 2014 none of the termini reach the floor of the main valley. As the stagnant ice melts, the lake area is expanding indicating that a new alpine lake will likely form. The retreat from 1990-2014 is 1300 meters. 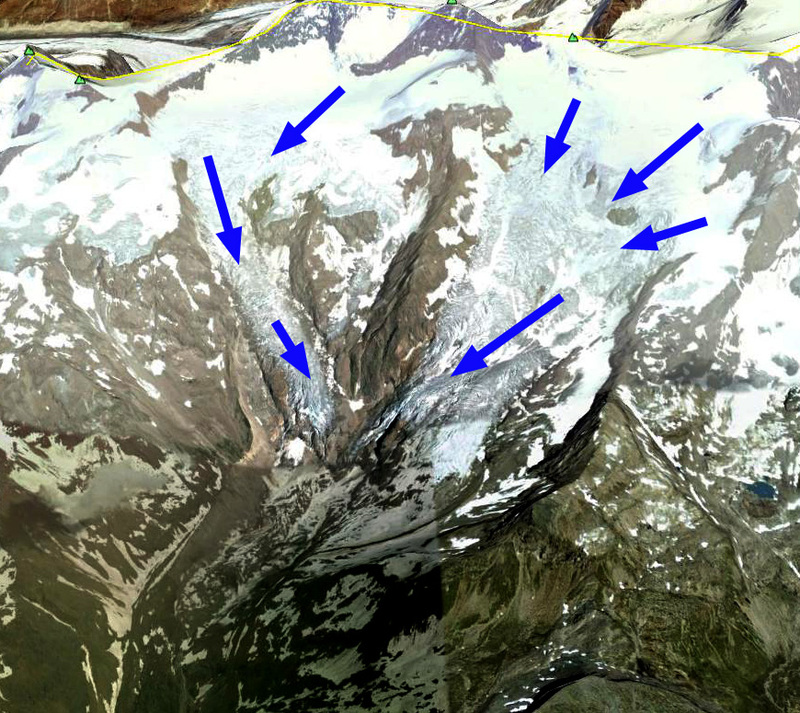 A closeup in 2009 from Google Earth indicates the two tongues with bedrock below separating them from the main valley floor, red arrows. 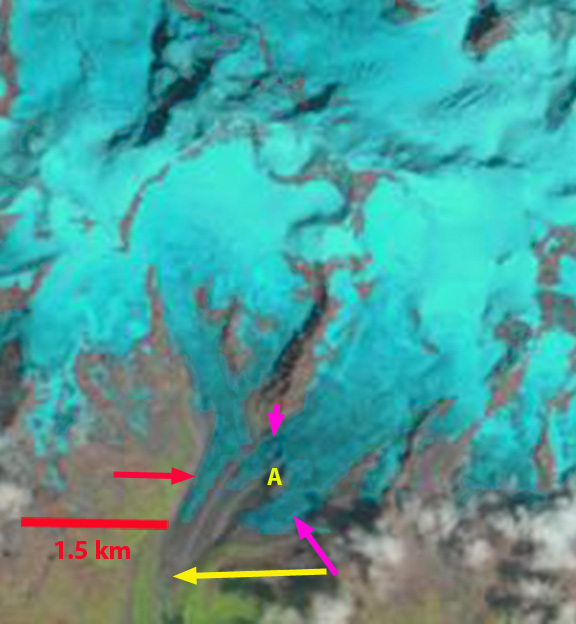 There is still some relict ice below on the valley floor detached from the active glacier, blue arrows, that has small lake developing amid the stagnant ice. There is substantial crevassing above both actual termini, but not immediately. The retreat should slow now that the glacier has retreated onto steeper slopes, having lost the low elevation low slope valley tongue. The retreat of this glacier is similar to that of nearby Verra Grande Glacier. This entry was posted in climate change glacier retreat, Glacier Observations and tagged climate change glacier retreat, Italy glacier retreat, Lys Glacier Retreat, monta rosa glacier retreat. Bookmark the permalink.